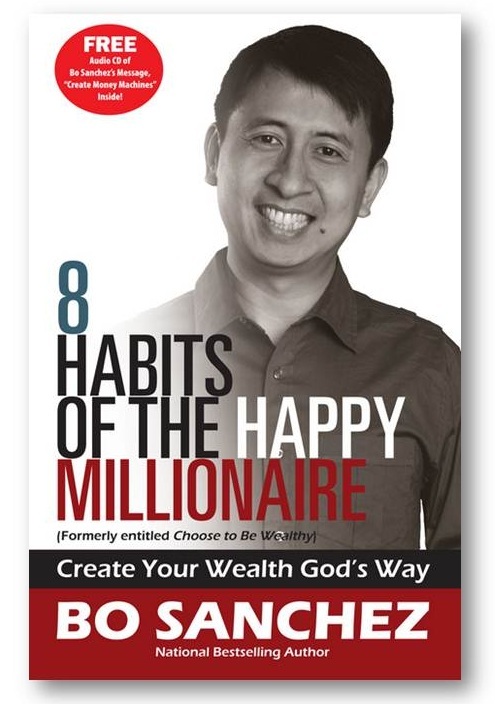 Yesterday I got a chance to read again this eBook entitled "Choose to Be Wealthy - 8 Habits of Happy Millionaires" written by the founder of Truly Rich Club, Bo Sanchez. A highly recommended and a must-have book from Bo Sanchez' Personal Finance Series Books. A simple request. Tell me what can you say about these 10 Principles in Starting a Business, and I will send you a copy of this eBook: "Choose to Be Wealthy - 8 Habits of Happy Millionaires". 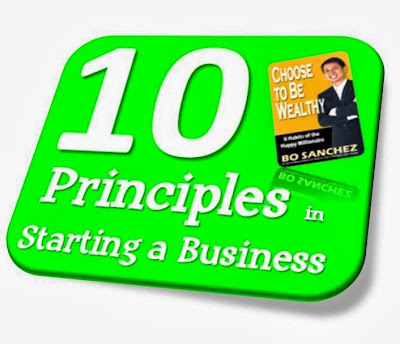 On the last part of the book Bo Sanchez suggested these 10 Principles in Starting a Business. Please read and learn from this as well. Here they are. Let's practice these principles. 1. Find something you’re passionate about. I cannot emphasize this enough. Obviously, you need to know yourself well. What is your core gift? What is play to you? 2. Get firsthand experience in the business.If you don’t have this firsthand experience, then look for one. Work for free if you have to and expose yourself to a similar business. 3. Start small. You’ll always make mistakes at the start, so make your mistakes small by starting small. 4. Dream big. How do you plan to expand your business? When you start a business, have a rough plan on how to duplicate yourself and serve more people. Be cautious about starting a business you can’t duplicate or scale up. 5. Have mentors. There are people around you who are already doing what you want to do. They’ve been doing the business for 20 years. They’ve learned so much. Find them and pick their brains. Copy first. Doing so will save yourself from a lot of pain. 6. Learn a new skill: How to run a business. My friend Maila knows accounting. In fact, she’s an expert. But she doesn’t know how to run a business. So this is a new skill she has to learn. Another example: You may be a great cook but running a restaurant is a totally different ball game. That requires not just cooking, but managing staff, balancing accounting books and marketing to new customers. 7. Be a marketing expert. Marketing is the lifeblood of any business. No marketing, no customers. No customers, no sales. No sales, no money. It’s as simple as that. The owner of the small business must learn marketing or his business fails. 8. Focus on your strength. At the start, expect to do everything. From sales to messengerial to janitorial services. But as your business grows, focus only on your core gift and outsource other tasks to experts. Do what only you can do. Delegate the rest. 9. Hire people better than yourself. When you hire people, hire always the best. In fact, hire people better than yourself. 10. Be a relationship expert. At the end of the day, business is about relationships. It’s building great relationships with your staff, your suppliers, your partners, your regulators and your customers. Without good relationships, your business will be short-lived. Also in this book, "Choose to Be Wealthy", you’ll learn the 8 Habits of Happy Millionaires, which includes…Find Your Emotional Hunger, Be Consistently Aggressive, Create Money Machines, Stick to Your Game. Being a member of the Truly Rich Club, we also received a copy of video and audio materials called POWER TALKS, we got the same topics Bo Sanchez discusses in this book. I love listening from TRC audio and video. You can enjoy the same benefits by being a member now. I strongly believe that in order to keep up with your business, it is important that you have the passion so at least if all else fails at first, the love for it is still there, and that strives you to keep going. I read the book 8 secrets to truly rich and have learned that marketing is really important. And based on observation (in tv ads, fb marketing etc. ), great marketing always leads to huge followers. I would say that most people don't know their core gift /passion and it's not easy to find this in ourselves including me. Not all mindset and strategy works the way we want it. And it would not be easy handling your business firsthand when you are an ofw and you know you're the only one in your family who have interest in business. I would agree with most of the 10 principles above but I guess this would be case to case basis. So I'm keen to know the contents of the book and learn from it. I agree that the first step in starting a business is analyzing oneself. Personal factors, e.g., personal interests, talent/knowledge/skills and experience need to be considered in identifying business opportunities. I believe that engaging in a business activity that is close to one's heart and within one's abilities has better chances of succeeding than operating a business that one has little interest/ knowledge of. I wish to learn more from the book. I'm so eager to have copy of it. I firmly believe that in order to run a successful business, it should be founded with firm pillars. The 10 principles of starting a business can be used by anyone especially those who are yet to envision where to go. It should be kept in one's mind that these principles go hand-in-hand. You lack one of these means you'll run a business that lacks it's basic principles. I always dream that someday, I will be free from being a mere employee and start to become an entrepreneur. I have many business ideas that I can think of yet I am still lack in capital and in business plan. Very good points. For me the most striking of all are principles #1 and #10, passionate and building relationships. Those 2 attributes digs basically on a persons attitude. It should normally come naturally in them. In my opinion, if you have those 2 traits it will be easy to learn the other factors to start a business. I believe that you need to have passion for business before even trying to go into one. If you love something even if you fail you'll definitely go for another chance. I believe that building relationship is one of the most important investment/business strategy thay we need to acquire. I that case, we will not only earn wealth but friends too.. The 10 Business Principle is essential in any kind of business for someone who have no idea how a business works. Putting up a business is not just about having money to start with. The personal touch of the owner is very important.